Farming fans the time has come and Farming Simulator is here, but is it any good and better than last year? Last year we had the opportunity to review Farming Simulator on the Nintendo Switch and it actually was a pleasant surprise scoring 8 out of 10 in our full review. Some of the main benefits of playing on the Switch was being able to play on the go but will the added horse power on the Xbox One X make up for the lack of being able to play on the go? One thing is for sure and that is Farming Simulator wont be a game for everyone, much like last year it will have more appeal to players with real life farming knowledge that will actually have some idea what different tools and machines are used for. Farming Simulator is to farming fanatics what Forza is to car fanatics, the game features plenty of licenced vehicles for farming fans to get excited about, while some racing games will feature Ferrari’s and Lamborghini’s Farming Simulator will have top farming brands such as John Deere, Case and JCB. Players in career mode will be greeted with a character customisation option, the options however are very basic with eight different characters to choose from including both men and women. There is is the option to change the haircut with four different styles to choose from but sadly the colour cannot be changed. The other options that the player can adjust are cosmetical including different hats, jackets that can also select different colours and the ability to wear sunglasses so as said previously the options on offer are very basic with little customisation. The career mode gives players a difficulty option selection, new farmer, farm manager and start from scratch. Start from scratch is basically the hardest option and players will start with no land or equipment with a tough economy as well as low prices giving the game it’s most realistic and toughest setting. The new farmer setting is the one I would recommend if you are new to the game as you will already own some land and equipment and the game will teach you how to play and get started. After getting the basics of the game it’s all about the actual farming, luckily there is actually the option of using workers to go up and down the field ploughing and combining the produce because trust me driving up and down in one of the games many vehicles really is about as fun as it sounds! The game is a bit more of Farm Manager at times, just keeping all the workers going and moving produce into silos when they are done is more than enough to keep you busy. The workers obviously save the game from being a really boring experience and take out the repetitiveness of driving up and down a field but they do occasionally stop from time to time, if something is obstructing them you will have to hope out and clear the obstruction so keeping things ticking over will more than keep you busy, unless of course you actually want to drive up and down all day but that’s totally up to the player but the option is there. It’s not just farming that can be done in the game either there is the option of livestock too and even a pet dog, this dog is a very special dog with the ability to walk straight through walls! The pet dog will just stay in the area around it’s doghouse but for some reason they have decided to run it’s path straight through the side of the doghouse, one way to kill a bit of the immersion! While the dog doesn’t earn any money it can be told to follow you and also you will have the option to pet your new buddy which will make the dog roll over, after this you can send him or her home and they will run off in what looks like slow motion! A nice but pointless addition really. The dog was the cheapest and most basic one of all the animals, the actual ones that make money are the sheep, pigs, cows, chickens and horses. With making money the main aim of the game looking after the animals is essential, horses need to be trained and ridden which will increase their value to eventually be sold. Taking care of the pigs will allow them to reproduce and then can be sold for profit as well as feeding the cows the best produce you can make that will get the most milk from them that can be sold on for profit, I think you get the idea that if the animals happy the farm makes more money. There is plenty of different ways to make money and another one worth a mention is logging, grab yourself a chainsaw and find a tree and cut it down! You will need to cut it down into pieces and the prices that are paid for it will depend on the length and straightness of the wood, bent pieces will generally sell for less that long straight pieces to cut carefully to maximise the profit made. Once you do have enough money it’s worth investing in a tree harvester, this machine can take the tree all in one go and you can sell and deliver it to the sawmill. With the tree out the way the massive stump will be left and you will need a stump grinding machine to make easy work for you and clear the space for something new. The content on this game for actual farmers is actually ok and it’s a real simulator that takes itself very seriously! Players not into farming will manage to get the hang of things after a while with the tutorial but farmers will definitely have a major advantage as they will know what crops do what and what tools are needed for the job. At first I have to admit with all the different tools and certain button presses needed to activate certain things the whole experience is more than complicated and confusing but if you stick with it and learn the ropes it does all become a bit easier. I do sadly thing you do need to be into farming to really want to stick with this game as most people who know nothing about it will be completely lost but for farming fans there will be something that they will like. Buying more land, out buildings and vehicles will keep players busy for ages, with enough land and vehicles also gives the chance to make more produce and even more money, getting to the very top isn’t easy though and will take a long time to actually do it if you ever actually manage too! The start menu also has a fair bit of information with the help menu being pretty informative, giving player all the information if they inevitably do manage to get stuck on something, from here there is also the contracts section where you will be able to accept different contracts. Sometimes you won’t actually have the tools for the job but they can be leased if you don’t have the money to buy them outright which still gives the player the chance to complete the contract and earn the reward. The game features to different places to start from and the map is actually pretty large, exploring it will come pretty natural as you tug along your produce to it’s seller so you can reap the rewards and buy new gear as you and your farm progress. The vehicles and equipment will also deteriorate over time and will need to be either taken to a shop or taken to your own vehicle repair shop, sometimes the leasing option is better as I used it a few times just to see if the vehicle or tool I was buying was really the one I wanted before I actually forked out the cash to actually buy it. Buying new vehicles and equipment is a pretty important part of the game but it’s worth mentioning these things can also be sold, the selling price you get will obviously depend on the age and how much use it’s had but also another way to make a little more money back from the sale is to actually drive the vehicle to the shop to sell it, this will bag you 20% more if you go through the trouble of actually driving it to the shop so it’s well worth doing! Graphically the game isn’t fantastic and there are plenty of times where objects are clipping through other things such as the dog I mentioned earlier but all in all the visuals are more than acceptable with plenty of detail on the vehicles. The way the grain come out of the combine and into the trailer was really impressive seeing it fill the different areas that I moved the hose over on the trailer. Performance on the Xbox One X was also fine with no noticeable slowdown. Sound wise everything is very quiet as you probably would expect being out in the country, birds can be heard chirping as well as vehicle noises that sound as you would expect from a tractor or combine. The controls are well used and cram alot into the few buttons a controller has, like I said earlier things can be complicated especially if you are new to the game but there is a small window in the left top corner that shows what buttons need to be pressed to perform certain actions, this is a huge help and without it I think I would be totally lost or spending alot of time in the games menu! 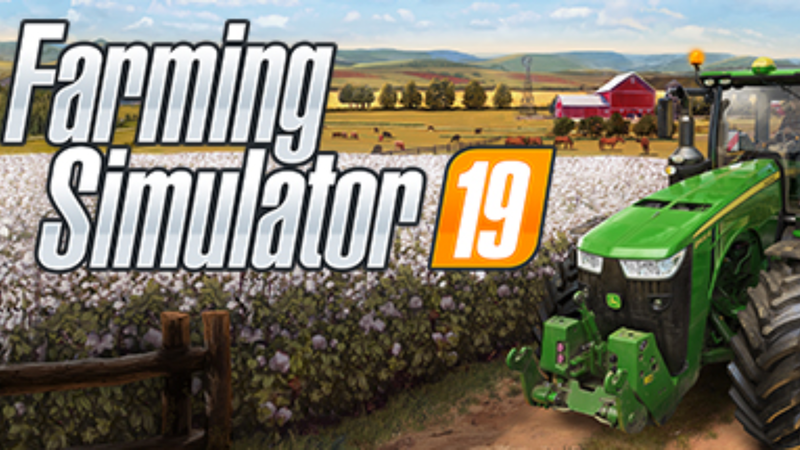 Farming Simulator 19 is certainly not going to appeal to many in my opinion, the game will need a very dedicated player that can sit through the boring and repetitive tasks that the game has to offer. Real farming fans and fans of the previous games will most likely see this as an improvement but it’s hard to see anyone with no farming experience finding this game fun. Visually it isn’t terrible and it’s great to see all the different licenced vehicles and equipment the game has to offer but it’s just the repetitiveness of the game that kills it and I think many players will get bored and sadly never come back. The Nintendo switch benefited with it’s portability and being able to just grab an hour if you was bored somewhere but sadly with some of the other games around on the Xbox One it’s impossible to recommend unless you are a farming fanatic and in that case it maybe worth buying!